Disclaimer: the nice squirrels at Cheeky Drop are providing Eating Adelaide with some Friday drinks of its own. You would imagine that Friday drinks are something of an institution but I bet many readers are out there who have never worked anywhere where Friday drinks are on the boss. There’s a massive number of reasons for this: obviously someone in accounts has to open the corporate wallet but bosses also have to be mindful of responsible consumption. Yep – some people still think it’s OK to drink and drive (especially if someone else is paying) and then unfortunately you always get the few people who exploit the boss’s generosity, have too many drinks and then behave like idiots. As with the schoolyard, there’s very often just the one person who spoils it for everyone. I’ve been very lucky. Quite a few of my employers (including my current one) have laid on drinks on some form or another. One place had very casual team based drinks every Friday (I kid you not) and then on a regular basis had a bigger, catered events for the whole company. Currently, I can enjoy a few free drinks on the first Friday of the month. When I lived in England, free drinks on any kind of regular basis were thin on the ground – but that might have been because everyone was more than happy to go to the pub and pay for their own! But that didn’t stop employers putting on very impressive Christmas dos and putting on things like beer and pizza on Christmas Eve. And when I say “Christmas Eve” I mean 10am. Personally, I’m in favour of Friday drinks – it’s lovely to socialise with colleagues and I suspect bosses are secretly pleased with the amount of work chat that goes on! I’ve never been to a works drinks where everyone hasn’t been catered for – I enjoy my work functions just as much when holding a glass of water or orange juice as I do when holding a beer. Anyway, enough about me because this is actually all about you and how you and your colleagues can treat yourselves to Friday drinks. 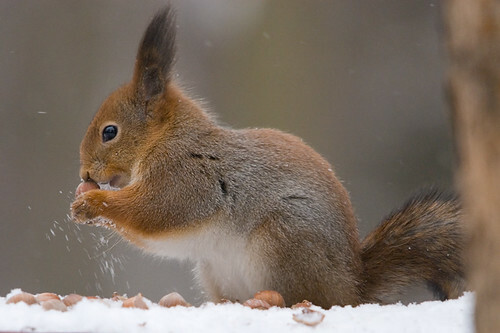 And not just any Friday drinks … but Friday drinks delivered by a squirrel*. The squirrel will turn up with a case of wine and all you have to do is enjoy yourselves. Of course, you do have to put some effort in here. You need to tell the squirrels why you need the drinks, you need a bit of facebook or twitter action (and while you’re over at facebook don’t forget to like Eating Adelaide). The competition is open now and a winner is going to be drawn every Wednesday (so delivery can be arranged in time for Friday) until 30 May. The first winner is drawn next Wednesday 18 April. Full details can be found over at Cheeky Drop. Get entering! * Note that the squirrel is a person in costume, but I have been assured that that is what you will get!